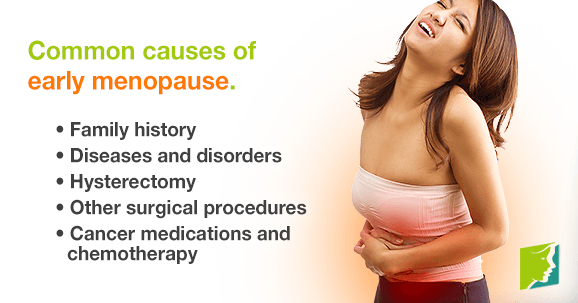 What Are the Causes of Early Menopause? Women generally enter menopause between their mid-40s and 50s, but sometimes symptoms can start much earlier. If you're one of the women whose entered menopause before middle age, understanding why these changes are happening can help alleviate the stresses of early infertility. Keep reading to learn more about the causes of early menopause. Family history. Most women experience menopause at the same stage in life as their mothers did. If your mother went through menopause early in life then your own experience is likely to mirror hers. Diseases and disorders. Viral infections affecting the number of eggs in your ovaries, disorders impacting ovulation, diseases that harm your hormonal glands and malnutrition experienced during ovarian development: all of these factors are issues that can contribute to premature menopause. Discuss your medical history with a doctor to discover whether it may impact your ovulation. Hysterectomy. Another common cause of early menopause, the removal of your ovaries will end ovulation and cause a sudden drop in estrogen and progesterone levels. This procedure can cause you to experience more extreme menopausal symptoms as the surgery triggers a significant reduction in hormone levels. Other surgical procedures. Damage caused to one or both ovaries during surgery can affect ovulation and in some circumstances lead to premature menopause. Tubal ligation, or getting your “tubes tied,” can cause ovarian failure by cutting off the blood flow to your ovaries. Cancer medications and chemotherapy. The high doses of radiation used to kill cancer cells during chemotherapy can damage your ovaries, sometimes leading to premature menopause. Tamoxifen, another drug used to treat and prevent breast cancer, can sometimes instigate early menopause (as can certain radiation treatments). Sometimes there are no straight forward answers as to why menopause occurs early for some women, and not for others. Discuss your experience with a doctor to learn more about the causes behind early menopause, and what can be done to ease your transition.Learn more about early menopause here. Many women going through early menopause are troubled by the idea that she may not be able to bear children. Read all about the advantages of early menopause here so that you can transition into your postmenopausal years with an optimistic outlook on life.